beCaUSE our shelters save lives! ​At Native Storm Shelters we are in the business of protecting lives. Something that we take very, very seriously. We build our storm shelters incredibly strong so that you can be confident that you and your loved ones will be safe, during any storm. In Oklahoma the threat of a tornado is very real and we average 52 tornados every year, some are devastating like the one in Moore. Texas experiences an average of 146.7 each year, holding the record for the state with the most tornados. Oklahoma comes in third,, with an annual average of 65.4 tornados a year. It’s obvious that tornados are dangerous, property is destroyed and lives are lost but property can be replaced, lives can’t. Every family should have the security of a storm shelter at their home. A storm can occur at any time and you may have just minutes to take shelter from an F4 tornado and without having a tornado shelter to take cover in, you could become its victim. Our company was founded on an idea and a desire to make an incredibly strong and reliable shelter that would protect people in the event of a devastating F5 tornado. Pen was put to paper, designs were drawn and models were built and tested. After several designs and tweaks, we’ve developed one of the strongest and safest tornado shelters available on the planet. Our team personally put these models through some vigorous tests until we found what we considered to be the very best storm shelter design. But we weren’t done yet, not by a long shot. Our above ground storm shelters have been tested by Texas Tech for impact of debris and passed with pride. They air cannon fired full length 2x4’s directly at key impact points on the door and side and our shelter stayed safe and secure. You can [Click Here] to watch video of the actual test! A tornado is a product of specific weather conditions, usually at the head of a cold front moving into warm air. In Oklahoma and Texas this occurs mostly in the months of April, May and June when warm air from the south suddenly meets a cold front caused by a dip in the Jetstream. This brings down some of that cold Canadian air that slams into some warm air causing severe thunderstorms as well as tornados. Obviously the local weather station can alert you when conditions are going to be right for tornados, severe thunderstorms and microbursts to occur, the question is, “how much time will you have to take cover?” It could be minutes or even seconds. Shouldn't you have a safe and secure place to take cover? This isn’t something that you can put off doing. You and your loved ones depend upon it and they deserve to be safe. You may be using the excuse “I can’t afford it”, but may I ask you what a life is worth? Did you know that there Grants and Vouchers to help you to purchase a Storm Shelter? Just [Click Here] for details. 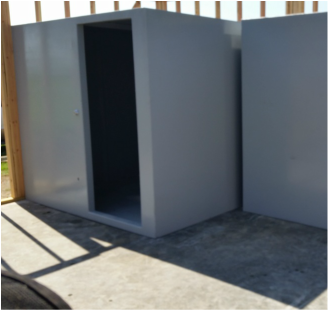 Native Storm Shelters designs, builds and installs both below ground storm shelters as well as above ground storm shelters. The above ground models can be “free standing” anywhere on your property or installed inside of your home or garage. They are carefully anchored to a concrete slab so that they remain in position regardless of the storm level. We also manufacture garage units which are placed directly into the floor of the garage. You and your loved ones can ride out the storm safe and sound because you’re below ground, surrounded by earth, steel and concrete. [Click Here] for more info. Are you a prepper who’s looking to build an underground bunker to ride out Armageddon? We’ve got you covered there too. 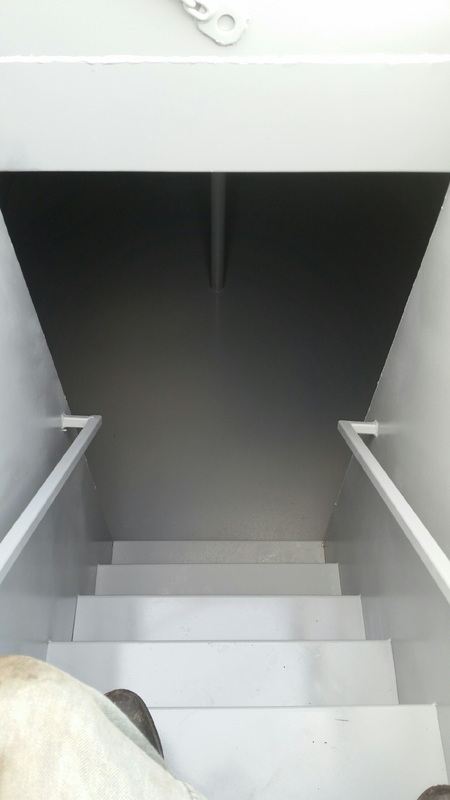 We build some amazing, all steel bunkers to protect your family. Plenty of room to store food, essentials, weapons and more. They have ventilation and can be lived in for extended periods. Built super safe and strong, the steel doors lock up tight and can’t be broken into. Need some extra piece of mind that you’ve got a safe room to enter should you be the potential victim of foul play? In today’s world you can’t really trust the way you used to. You could find yourself the target of a home invasion and in that case, you want to have somewhere safe to hide. A place where, even if the bad guys find you, they can’t get to you. That’s the security of a safe room. These can be hidden and completely disguised but easily accessible when you need to go there. They can double as a gun safe, or a safe place for any other valuables. Check out our safe rooms, just [Click Here]. Our team is dedicated to providing exactly what you need so if you don’t see it here, we can build it for you. Our staff will take the time to listen to your needs and create what your vision is. Just give us a call, our goal is to delight our customers by providing the best quality, the best service and the best price, delivered with a smile! Our products are all manufactured in Calera, OK in our factory, by local employees. Every single item that leaves our factory is made with the utmost care because our reputation is at stake, but more importantly, "lives". Our welders take the time to make certain that each weld is done properly to retain strength over the years. Our painters make certain that the surfaces are properly prepared before primer is applied and then several coats of paint are applied on top. Areas which will come in contact with soil need additional corrosion protection and we coat these with a specially developed product meant for underground contact. Fit and finish is critical to us, because we want you to own the very best, your family depends on that. When you speak with one of our representatives you’ll be speaking to someone is knowledgeable and can guide you to the right product and design. They can also help you with any of your questions about the products or some of the grants and vouchers that are available. You can place your order with them, or schedule an appointment to meet in person. Once your shelter is made and ready for delivery, installation is typically done in just a single day. We personally install many of our shelters however we also have trained, authorized sellers and installers throughout Oklahoma and Texas. So no matter where you are, we should be able to service your needs. We are centrally located in order to serve both the Dallas and Fort Worth Texas areas as well as Oklahoma City and everywhere in between! ​"I am very pleased with my safe room. I expressed my needs, and they built the safe room to meet those needs! I wan to thank the Choctaw Nation for helping me to get the safe room, and thank you Native Storm Shelters for doing such a great job building and installing my safe room." - ​Kathleen M.
​"If you need a storm shelter, the very best is NATIVE STORM SHELTERS! and not ask for more MONEY!!! Follow us on social media Click below to share! Do you have questions about products, installation or easy financing?